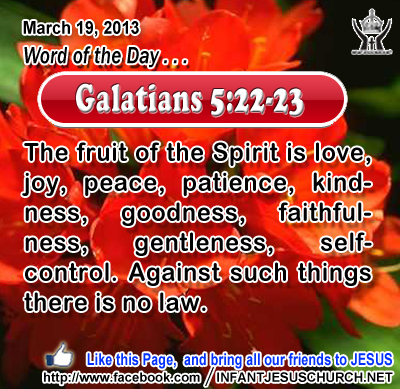 Galatians 5:22-23: The fruit of the Spirit is love, joy, peace, patience, kindness, goodness, faithfulness, gentleness, self-control. Against such things there is no law. Heavenly Father, through the Spirit we call upon you. Please fulfill in us the character you possess. We want to exhibit the qualities of your child, Jesus, in whose name we pray. Amen. 21Again he said to them, "I go away, and you will seek me and die in your sin; where I am going, you cannot come." 22Then said the Jews, "Will he kill himself, since he says, `Where I am going, you cannot come'?" 23He said to them, "You are from below, I am from above; you are of this world, I am not of this world. 24I told you that you would die in your sins, for you will die in your sins unless you believe that I am he." 25They said to him, "Who are you?" Jesus said to them, "Even what I have told you from the beginning. 26I have much to say about you and much to judge; but he who sent me is true, and I declare to the world what I have heard from him." 27They did not understand that he spoke to them of the Father. 28So Jesus said, "When you have lifted up the Son of man, then you will know that I am he, and that I do nothing on my own authority but speak thus as the Father taught me. 29And he who sent me is with me; he has not left me alone, for I always do what is pleasing to him." 30As he spoke thus, many believed in him. The essence of sin is that it redirects us from God and from our true purpose in life - to know the source of all truth and beauty which is God himself and to be combined with God in everlasting joy. When Adam and Eve first sinned, they hide themselves from God. That is what sin does; it separates us from the One who is all loving, all-wise, and all-just. Jesus went on to make clear that if people could not recognize him in his word, they would have the chance to recognize him when he is "lifted up" on the cross of Calvary. Jesus pointed to the atoning sacrifice of his life on the cross as the true basis of healing and victory over the sin of the world. The surrender of Jesus’ life on the cross for our sins is the ultimate proof of God's love for us. God so loved the world that he gave us his only Son, that whoever believes in him should not die but have eternal life. To fail to distinguish Jesus and where he came from is to remain in spiritual darkness; to believe Jesus and his words is to walk in the happiness and light of God's truth. There are certain opportunities in life that come and do not come back. Each of us is given the opportunity to know and to accept Jesus, as our Lord and Savior. But that chance can be rejected and lost. Life here is limited and short, but how we live it has everlasting consequences. Loving Infant Jesus, grant this day, to direct and sanctify, to rule and rule our hearts and bodies, so that all our thoughts, words and deeds may be according to our Father's law and thus may we be saved and sheltered through your mighty help.